Australian synthpop rising stars Tim & Jean may only be 17 and 20 respectively but they sure seem to be on the right track for international stardom. Hailing from Perth, the pair started recording demo tapes in a bedroom studio over three years ago. 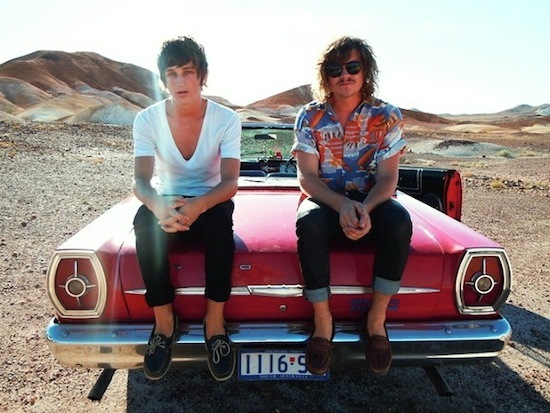 In late 2009, they made the finals of Aussie radio Triple J’s Unearthed High competition with their super catchy pop song “Come Around”. Heavy on synths but totally light-hearted, the track was wholeheartedly supported by Triple J and doors started to open for Tim Ayre (vocals and keys) and Jean-Christophe Capotorto (keys and guitars), who ended up signing a record deal with Mercury/Universal. Tim & Jean’s debut album, Like What, is a collection of ten feel-good tracks that clearly reflects their love of 70s soft rock (Tom Petty, Fleetwood Mac), funk and all things electro. Mixed in NYC by John O’Mahony (Metric, David Bowie, Bob Dylan), the album feels surprisingly assured and elaborate for a debut. You might get to a point of saturation after a few too many listens but there’s no denying the effectiveness of the duo’s melodies and arrangements. Enjoy their brand new single “Don’t Stop” and check out the video on Vimeo. If you like what you hear and you want more, here’s a little bonus for you. You can get a free download of Tim & Jean’s cover of Fleetwood Mac’s “Everywhere” in exchange for your email address HERE.